You are going to love this Hampton Virginia Engagement Session! We had the pleasure of meeting Vanessa & Anthony in June at Maggie & Kevin’s beach wedding and were so excited when they chose us to capture their day as well! For their engagement session, Vanessa & Anthony chose Fort Monroe and we had a great time talking and catching up! Fun Fact: we got stuck in a downpour and huddled underneath that gazebo for a good 10 minutes! We were hopeful it was going to stop so we just stuck it out and I’m so glad we did! The rain went away and the sun even made an appearance. We walked around different parts of the fort and ended at Oozlefinch brewery. Enjoy a few of our favorites from our time together. 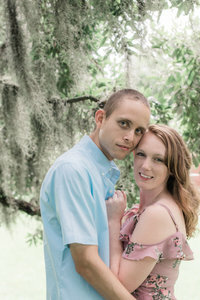 We can’t wait to see them this Saturday at their Lesner Inn Wedding!